When the sun rises, so, too, does possibility… but it doesn’t always feel like it. Although our mental space gets crowded out by the hustle and bustle of the holiday season, we long to reconnect to its true purpose: giving and receiving joy. Imagine how refreshing it would be to rise each morning with hope, purpose, and joy beating in your heart — even when you’re surrounded by chaos. The affirmations in this book will help you do just that this holiday season by energizing the positive perspectives needed to begin your day right. As you trade thoughts like “I feel so overwhelmed” for thoughts like “I am ready to do my best,” you’ll start to embrace the true qualities of the season, and a brighter reality. The first waking moments of your day promise a chance to begin again, perhaps a little bit better than before — a chance to forge pathways that are not dependent on yesterday or halted by tomorrow. With Morning Affirmations, you will be making the most of this golden time to practice the kinds of thought patterns linked with open-mindedness, happiness, and creativity. You’ll soon discover that the trick to rising and shining is no trick at all: just be willing and open to flourishing. Believe in possibility itself. Greet each day, and each season, with a narrative that serves how you want to experience life. In other words, tell the truths you want to come true. These affirmations will help you. I believe in my ability to figure things out. My growth is entwined with my positive state of mind. Everything I need is attainable, and I am capable of learning anything I really want to learn. I focus on what I can do from here: I can believe in myself. I create a stress-free reality. Stress is a response to needs going unmet. This response is a habit—one I can change. In this moment I clear away distraction and greet my needs with compassion. I listen and respond all day long, giving myself some much-needed grace. I turn tough lessons into blessings. My experiences are not mistakes. Everything I have gone through has planted something valuable in me or shown me something that I needed to see. I share my insights with care so that they become the blessings that someone else needs to feel. I practice loving my decisions. I do not need external validation to prove that I am on the right path. I am as I am on purpose. Today I live from a highly intentional place—in my own way, in my own time, one decision at a time. My relationships are platforms for growth. Instead of dismissing what I do not like or understand, I invite kind conversations about it. If suffering makes an appearance, I stop battling and start asking how we can grow through this. Together, care-fully, pain turns into peace. I prioritize the way I want to live. I choose the beliefs, rituals, and relationships that nurture my deepest peace and joy. I am not waiting to live my own definition of success. I am alive with a genuine interest in being here—as I intend to be. I have come to give. What I wish to see more of in the world is mirroring what I can give. My service feels light like love because that is what I am made of. I honor what fills my cup so that I can serve like the sun. I advocate for myself. I speak up lovingly and ask for what I need to feel whole and well. I stand my sacred ground and hold on to my peace. I am gentle with myself yet firm in my expression of what is right for me. I step forward, fully. I inhabit my experiences fully. I entertain the sweet simplicity of doing one thing at a time. I infuse space in between activities. I allow mental habits of busyness to unravel. I practice a new, fruitful habit: contentment of being. With less clutter in my mind I am more alive. My best is enough. I am always doing the best that I can with the clarity and resources I have. My personal best is subject to its own evolution. I show up today, willing to explore my next level of excellence. I experiment with new solutions. I improve with acceptance. I pay attention to what I want to grow. I can control what I focus on, so I focus on what I can control. I strengthen the feelings that I want to last; I tell myself only things that I want to come true. Life elevates what I pay attention to. I release my grip on the outcome. I may not see the big picture yet. The outcome may not reflect my plans. I rest in the certainty that life’s powerful current will carry me through. I go with this masterly plan. One experience at a time, my story is unfolding. I pursue my best life. In the still clarity of this morning I envision my best and truest self. I imagine harmonizing my inner and outer worlds—blending thought with movement. I delight in how I do what I do and use each moment to commune with my dreams. I breathe through every emotion. Whatever comes my way today, I can breathe my way through it. I start right now: breathing light and space down into my belly, my rib cage expanding in every direction. Conscious breathing is my freedom— through it my uncaged heart can sing. 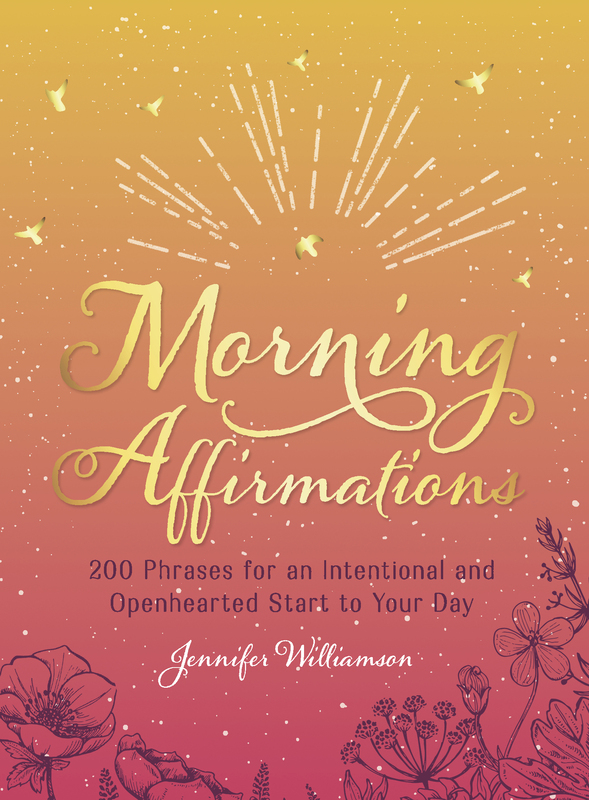 Excerpted from Morning Affirmations: 200 Phrases for an Intentional and Openhearted Start to Your Day Copyright © 2018 by Jennifer Williamson (AimHappy.com) and published by Adams Media, a division of Simon and Schuster. Used by permission of the publisher. All rights reserved.